I was just going to boil the kettle for my morning coffee, when I became curious. And I am afraid curiosity got this cat! I haven't weighed in since this time last month, and I wanted to know. I didn't have any expectations...I just wanted to peek. I mean who's ever happy to find out their weight has gone up, but it's just a number and I know myself that it will eventually come off through better eating and more moving about. Like I said in the previous post, my exercise has been better than my eating and I have actually been making an effort with that. Now all I need to do is rein in my eating and the scale may move down as a bonus to feeling amazing stomach-wise. My doctor keeps pestering me to keep a food diary, but I am afraid it just doesn't work for me. I may remember for a day, but when those 24 hours are up I am hopeless and it gets lost under all the paperwork on my desk. So I think maybe a photo diary is the way to go and eventually write it down at the end of the day. Such a Great Thing to Remember! 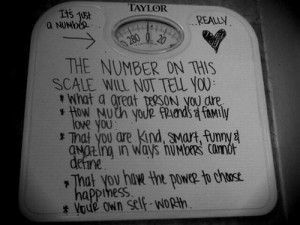 Do you have any tricks for when the scale goes up? What reassures you?